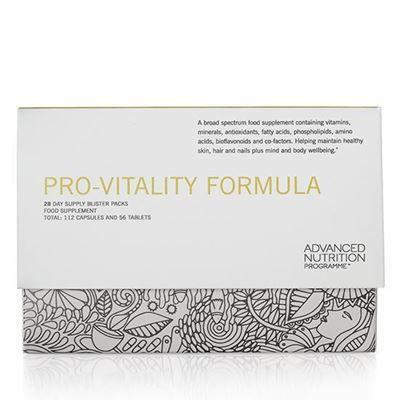 Advanced Nutrition Programme Pro-Vitality Formula Developed by expert nutrition consultants, each daily blister strip contains 6 top-of-the-range supplements for optimal wellbeing. > Vitamins D and calcium are important to the maintenance of your bones and muscles. > Enriched with essential fatty acids, amino acids and herbal extracts. Take the contents of one blister strip daily with a meal or as your health professional advises. Each blister strip contains: multivitamin/mineral tablet, advanced antioxidant complex capsule, vitamin C with black elderberry and bilberry extracts tablet, omega 3 and 6 fatty acids capsule, brain-specific nutrients capsule and n- acetyl L-carnitine and alpha lipoic acid capsule. This product should not be used as a substitute for a varied and balanced diet and healthy lifestyle. Do not exceed the stated recommended daily intake. Store below 25º in a dry place away from direct sunlight and heat. Do not take if pregnant, planning a pregnancy or breastfeeding, unless on the advice of a doctor or antenatal clinic. If you are under medical supervision, please consult a doctor before use. Caution is advised with anticoagulant medication such as heparin, warfarin or coumadin. Not to be taken in cases of manic depression or epilepsy. Not to be taken in conjunction with mood modifying drugs. Amounts greater than 1000mg of vitamin C may cause mild stomach upset in sensitive individuals. Long term intake of amounts greater than 10mg of vitamin B6 daily may lead to mild tingling and numbness. This product contains iron, which if taken in excess, may be harmful to very young children. Keep out of sight and reach of children. Ingredients: bulking agents (dicalcium phosphate, microcystalline cellulose, calcium carbonate, corn maltodetrin), Vitamin C (ascorbic acid, magnesium ascorbate), fish oil, capsule shell (fish gelatine and glycerol), evening primose oil (antioxidant:dl-alpha tocopherol in sunflower oil), N-acetyl cysteine, capsule shell (hydroxypropyl methylcellulose), colours (titanium dioxide, copper complex of chlorophyllins), choline bitartrate (anti-caking agent:silicon dioxide), pantothenic acid (calcium d-pantothenate), calcium citrate, lutein prep (lutein 10%, corn starch, modified starch, sodium ascorbate, glucose, antioxidant:dl-alpha tocophetol), niacin (as nicotinamide), alpha lipoic acid, L-arginine Pyroglutamate, Vitamin E (d-alpha-tocopherol succinate), anti-caking agents (silicone dioxide, vegetable magnesium stearate), bilberry fruit extract (Vaccinium myrtillus) and bilberry fruit powder (Vaccinium myrtillus), citrus bioflavonoid complex, magnesium citrate, aceryl-l-carnitine HCL, zinc citrate, tablet coating (hydroxypropyl methyl cellulose: titanium dioxide, riboflavin:glycerin), beta carotene (from Dunaliella salina algae) prep (mixed carotenoids, sodium alginate, soya protein, gum arabic, maltodextrin, corn oil, citric acid), acacia gum, thiamine (thiamine hydrochloride), manganese ascorbate, vitamimn B6 (as pyridoxine hydrochloride), riboflavin, inositol, para amino benzoix acid (PABA), iron fumarate, rosehip powder, grapeseed extract (Vitis vinifera) (95% OPC), lycopene prep (lycopene 10%, corn startch, modified starch, glucose, antioxidants:dl alpha tocopherol, sodium ascorbate), anti-caking agent: stearic aicd, phophatidyl serine-rich lecithin from soya(anti-caking agent:silicon dioxidie), tumeric (Curcuma longa) dried root powder, green tea leaf (camellia sinensis) extract (50% polyphenols), cross linked cellulose gum, vitamin A palmitate prep (antioxidant dl-alpha tocopherol), sodium borate, hesperidin powder, rutin powder, Vitamin D pre(ergocalciferol, acacia gum, sucrose, sunflower oil, corn starch), sodium molybdate, chromium picolinate, d-alpha tocopherol, glycerine, sodium selenite, folic acid, d-biotin, potassium iodide, vitamin B12 (hydroxycobalamine and mythylcobalamin), glazing agent:carnauba wax.